Acres upon acres of open lakes, breathtaking nature preserves, and a masterpiece private golf club – it sounds like a dream, but this is the reality for The Quarry at Naples. 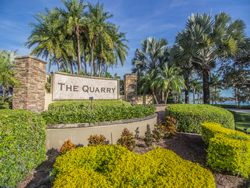 A new community in the area, The Quarry has quickly established itself as one of the most prestigious in Southwest Florida. Conveniently located just East of I-75 and just minutes from Florida’s famous Gulf coast, this community is a creative mixture of intimate carriage homes, single family homes, gorgeous estate homes, and custom homes available from the finest builders in the state. The quiet neighborhoods of Silverstone, Quartz, and Cove are home to the most unique and attractive carriage homes in Southwest Florida. Priced starting in the affordable low-$200s, these homes are perfect for anyone looking for a cozy hideaway amongst the palms and preserves of The Quarry’s natural landscaping. These homes are located in the neighborhoods of The Shallows, Cobalt Cove, and Spinner Cover. With price starting at the mid-$200s, you’ll be get your money’s worth and more – these homes are built up to 2,600 square feet. Plus residents of Spinner’s Cove can enjoy direct access to the popular and beautiful Boulder Lake. Starting at the mid-$400s, these attractive estate homes are located in the neighborhoods of Hideaway Harbor and Copper Canyon. Between lakefront properties with private docks, three unique and elegant floor plans to choose from, and proximity to the golf course and beach club, The Quarry’s estate homes are the perfect solution if you want luxury, affordability, and a fabulous location. The equity membership course is the perfect challenge for every skill level, with 5 separate tee boxes ranging from 5,094 yards to a staggering professional length of 7,316. A fully-stocked pro shop is manned by a team of PGA Professionals, and all of your golf needs are taken care of by Head PGA Teaching Professional Matt Russell. The club has numerous events scheduled for the members throughout the year, including specified days for men’s and women’s play, and on days the course is unavailable, The Quarry provides a reciprocal program with nearly 50 other courses in the area for you to play.